Objective Maternal glycemia plays a key role in fetal growth. We hypothesized that lower glycemic load (GL) meals (lower glycemic index, modestly lower carbohydrate) would substantially reduce day-long glucose variability in women at risk of gestational diabetes mellitus (GDM). Research design and methods A crossover study of 17 women (mean±SD age 34.8±4 years; gestational weeks 29.3±1.3; body mass index 23.8±4.7 kg/m2) who consumed a low GL or a high GL diet in random order, 1-day each, over 2 consecutive days. Diets were energy-matched and fiber-matched with 5 meals per 24 hours. All food was provided. Continuous glucose monitoring was used to assess diurnal glycemia. Results Maternal glucose levels were 51% lower on the low GL day with lower incremental area under the curve (iAUC±SEM 549±109 vs 1120±198 mmol/L min, p=0.015). Glycemic variability was significantly lower on the low GL day, as demonstrated by a lower average SD (0.7±0.1 vs 0.9±0.1, p<0.001) and lower mean amplitude of glycemic excursions (2.1±0.2 vs 2.7±0.2 mmol/L, p<0.001). Conclusions A lower GL meal plan in pregnancy acutely halves day-long maternal glucose levels and reduces glucose variability, providing further evidence to support the utility of a low GL diet in pregnancy. Glycemic variability, characterized by acute and chronic glucose excursions, is an important predictor of comorbidities in individuals with diabetes. Low glycemic index (GI) foods produce lower postprandial blood glucose spikes compared to high GI foods. In several randomized controlled trials (but not all), low GI diets in pregnancy have resulted in lower (normalized) birth weight, lower ponderal index improved glucose tolerance, lower gestational weight gain, and reduction in need for insulin therapy in women with gestational diabetes mellitus (GDM). Low glycemic load meals improve diurnal glucose control and produce less glycemic variability than conventional diets in women at risk of GDM. Modestly lower carbohydrate diets with an emphasis on low GI food sources can be recommended to women at risk of developing diabetes in pregnancy. Blood glucose concentrations are strongly influenced by the quality and quantity of carbohydrates in the diet. In healthy individuals and those with diabetes, low glycemic index (GI) foods produce lower postprandial blood glucose spikes compared to high GI foods11 and have been associated with improved diurnal glycemic profiles and lesser glycemic variability, compared to a high GI diet.12–15 Dietary glycemic load (GL), the product of the GI of a food and its carbohydrate content, has been found to be the best predictor of postprandial glycemia and insulinemia in healthy adults consuming a mixed diet.16 Thus, the combination of a modestly lower carbohydrate intake from low GI food sources with a reciprocal increase in fat and protein may be the simplest dietary strategy to optimize maternal glucose control. Until now, no study has explored the effect of diets of varying dietary GL on diurnal glucose levels and glycemic variability in pregnancy. The aim of this study was to use continuous glucose monitoring (CGM) to test the acute effect of two fiber-matched diets, one high GL and one low GL, 1-day each, on glycemic profiles and glycemic variability in third trimester pregnant women at risk of GDM. We hypothesized that the low GL meals would produce lower diurnal glucose levels and lesser glycemic variability, compared to the high GL meals. 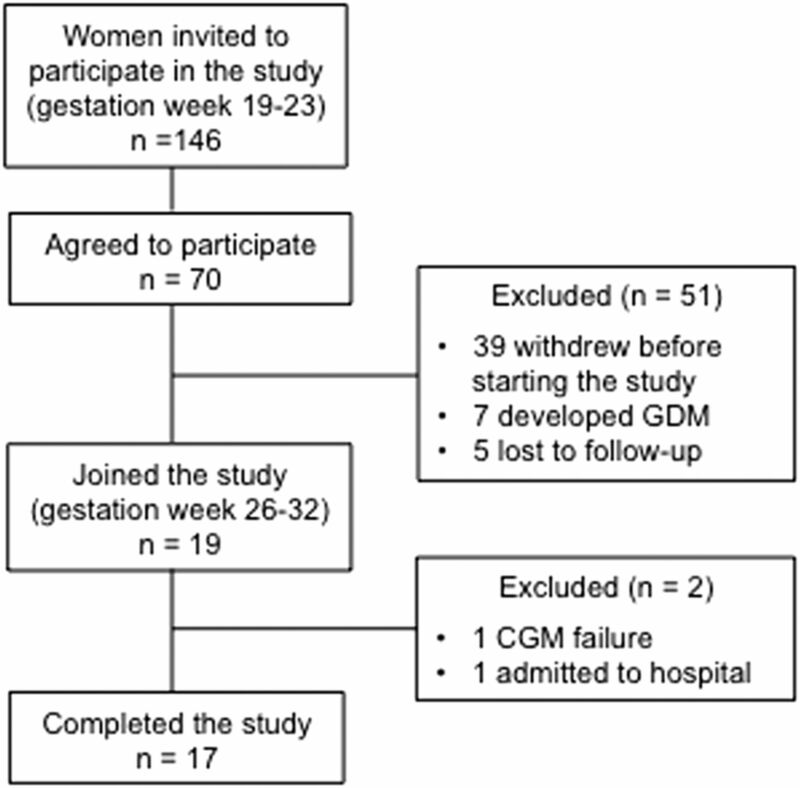 This was a within-subject randomized crossover trial comparing the effects of 1-day low GL meals and 1-day high GL meals, in women between 26 and 32 weeks of gestation at higher risk of GDM. Participants were recruited through the antenatal clinic at the Royal Prince Alfred Hospital, Camperdown, NSW, Australia. Women were prescreened at the time of their second obstetric appointment (19–23 weeks gestation) and invited to participate in the study. Those expressing interest were given details of the study and contacted again after routine testing for GDM at 26–28 weeks gestation. Women were eligible if they had at least one of the following risk factors for GDM: prepregnancy body mass index (BMI) ≥30 kg/m2, age ≥35 years, polycystic ovarian syndrome, history of GDM or glucose intolerance, history of a previous birth >4000 g, family history of type 2 diabetes (first-degree relative), belonging to an ethnic group with a high prevalence of GDM (Aboriginal, Torres Strait Islander, Polynesian, Middle Eastern, South Asian, South East Asian). Women with diagnosed GDM, pre-existing diabetes, multiple pregnancy or special dietary requirements (gluten-intolerant, vegetarian) were excluded. GDM diagnosis was based on the 1998 Australian Diabetes in Pregnancy Society (ADIPS) criteria until January 2015 (fasting BGL ≥5.5 mmol/L, 1 h BGL ≥10.0 mmol/L or 2 h BGL ≥8.0 mmol/L17) after which new diagnosis criteria were adopted recommending that fasting BGL >5.1 mmol/L be classified as GDM.18 In total, 146 women were approached between January 2014 and July 2015, of whom 70 expressed interest. Of these, 39 subsequently declined, 5 were lost to follow-up, and 7 were excluded following a diagnosis of GDM (figure 1). A total of 19 women met the inclusion criteria and started the trial. This study was approved by the Human Research Ethics Committee of the Sydney South West Area Health Service (RPAH Zone). All participants gave written informed consent. CGM systems (Medtronic MiniMed, Northridge, California) were used to electrochemically measure subcutaneous interstitial glucose concentrations every 5 min, generating 288 measurements per day. The monitors were calibrated four times a day against capillary blood glucose measurements, using blood glucose meters (Accu-Check Performa; Roche) as per the manufacturer's instructions. The monitors were placed on the lower back, on the right or left side, depending on the women's preference. Women were provided with all the foods required for the 1-day low GL meals and 1-day high GL meals. Dietary macronutrient composition of the two test days were formulated by the dietitian (SB) to produce a twofold difference in GL by reducing carbohydrate content and GI, while matching the fiber content and energy (table 1). The mean GL of the high and low GL days were 144 and 70 units, over the 24 h period, respectively. A within-subject crossover trial was used, and the order of the low and high GL days was randomized using a computer-generated randomization program. On day 1 of CGM use, women were instructed to eat at their discretion. On days 2 and 3, women were instructed to consume the test foods provided. On day 4, the CGM was removed and data of days 2 and 3 (midnight to midnight) were extracted for analysis. Dietary compliance was assessed using the log book. Women were asked to record the time at which the meals were consumed and whether the meals were consumed entirely. In a small number of women, plate wastage was recorded. Interstitial glucose values were obtained by CGMs. Comparison between the high and low GL days was assessed by paired Student's t-test. The mean amplitude of glycemic excursion (MAGE) was determined by calculating the arithmetic mean of the difference between consecutive peaks and nadirs if the difference was >1 SD of the mean glucose,19 ,20 using the automated GlyCulator algorithm.21 The incremental area under the curve (iAUC) was calculated across the 24 h, using the trapezoidal rule. The glucose value at midnight was used as baseline, and all the interstitial glucose output from the CGMs were used. Any area below baseline concentration was ignored. All the other variables were generated by transferring the CGM stored data into the data management system. The sample size calculation was based on the mean±SEM of iAUC glucose reported by Solomon et al22 in eight participants consuming representative diets (low GI or high GI) over the course of the day. In our study, a sample of 12 participants provided >80% power to detect a difference greater than twofold between the high and low GL groups, with an α-value of 0.05. In total, 19 women started the trial. Data were not recorded for one participant because of CGM failure. One participant was admitted to hospital on day 2 for reasons unrelated to the study, and her data were excluded from the analysis. Results were available for the remaining 17 participants, including two full 24 hours (midnight to midnight) glucose monitoring days. Dietary compliance was higher on the low GL day compared to the high GL day. On the low GL day, one woman did not consume the supper (∼960 kJ deficit). On the high GL day, two women did not consume the supper (∼660 kJ deficit), two ate half of the supper (∼330 kJ deficit), one ate half of the afternoon tea (∼420 kJ deficit) and one ate half of the breakfast porridge (∼280 kJ deficit). The omission of these foods resulted in a reduction in the daily total energy content of between 4% and 12%. The mean±SD age was 34.8±4 years and prepregnancy BMI was 23.8±4.7 kg/m2. The mean gestational age at study entry was 29.3±1.3 weeks, and 71% of the participants were Caucasian. 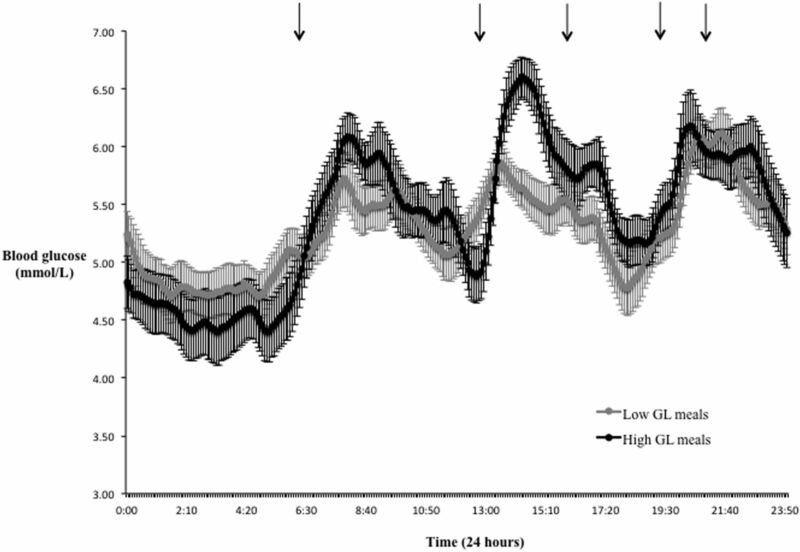 Diurnal glucose responses measured by CGMs on the high GL day and low GL day are shown in figure 2, and summary results are presented in table 2. Mean (±SEM) diurnal glucose levels following low GL meals (gray dots) and high GL meals (black dots). Average mealtimes are represented by the black arrows. Diurnal glucose levels were significantly lower on the low GL day, as demonstrated by a 51% lower iAUC on the low GL day compared to the high GL day (iAUC±SEM 549±109 mmol/L min vs 1120±198 mmol/L min, p=0.015). The peak glucose concentration was also significantly lower on the low GL day (mean±SEM 7.1±0.2 mmol/L vs 7.6±0.2 mmol/L, p=0.026). Time spent within the normal (target) glucose range was significantly longer on the low GL day, resulting from fewer above and lesser below target values, hence demonstrating less glucose oscillation (low GL 95.1±1.7% vs high GL 87.7±3.2%, p=0.031). Glycemic variability was significantly lower on the low GL day, as demonstrated by a lower average SD and lower MAGE (SD average 0.7±0.1 vs 0.9±0.1, p<0.001; MAGE 2.1±0.2 mmol/L vs 2.7±0.2 mmol/L, p<0.001). To the best of our knowledge, this is the first study to explore the effects of modestly higher protein/lower carbohydrate (lower GL) meals versus conventional meals on day-long glucose profiles in women at risk of GDM. Our findings show that the low GL diet achieved improved glycemic control as judged by ∼50% lower diurnal glucose levels, increased time within target glucose range and less glycemic oscillation than the conventional diet. Our findings have implications for improving the dietary management of pregnant women with overweight, obesity, and other risk factors for GDM. The strengths of this study include the randomized controlled design, the use of CGM with frequent assessment of maternal glucose concentrations across the day and the provision of foods with known (tested) GI and nutrient composition and the crossover study design. To best represent typical lifestyle patterns within the study, participants were free-living and the meals were consumed according to the mother's schedule. Our study had some limitations, most notably the small sample size and the short duration of the study; only 24 h per GL diet of CGM data were analyzed instead of an average over >1 day which might not represent the true day-to-day variation in glycemic response. Only acute effects were reported, and there was no lead in diets and no washout day. More tightly controlled meal times may have increased the differences between the two diets. In conclusion, this study showed that, in third trimester pregnant women at risk of GDM, low GL meals improve diurnal glycemic control and glycemic variability, compared to high GL meals. This study adds to the evidence supporting the utility of a low GL diet in pregnancy to optimize glycemic control. The authors thank all the study participants.
. The impact of in utero exposure to diabetes on childhood body mass index growth trajectories: the EPOCH Study. J Pediatrics 2011;158:941–6.
. The beneficial effect of a diet with low glycaemic index on 24 h glucose profiles in healthy young people as assessed by continuous glucose monitoring. Br J Nutr 2005;93:179–82.
. A low glycemic diet significantly improves the 24-h blood glucose profile in people with type 2 diabetes, as assessed using the continuous glucose MiniMed monitor. Diabetes Care 2003;26:548–9.
. Gestational diabetes mellitus—management guidelines. The Australasian Diabetes in Pregnancy Society. Med J Aust 1998;169:93–7.
. Low glycaemic index diet in pregnancy to prevent macrosomia (ROLO study): randomised control trial. BMJ 2012;345:e5605.
. Relationship of dietary fat to glucose metabolism. Atherosclerosis 2000;150:227–43. Contributors JPB-M, NVK, AB, JG, GPR, and TPM conceived and designed the study; NVK and JG researched the data; NVK analyzed the data and wrote the manuscript; SB designed the diets; and FSA was involved in the design of the diets and generated the incremental area under the curve. All authors reviewed and approved the final manuscript. JPB-M is the guarantor of this work and takes responsibility for the contents of the article. Competing interests JPB-M is the President of the Glycemic Index Foundation, Director of the Sydney University Glycemic Index Research Service and author of popular books about the glycemic index of foods. FSA is a director of the Glycemic Index Foundation, manages the Sydney University Glycemic Index Research Service and is a coauthor of popular books about the glycemic index of foods. No other potential conflicts of interest relevant to this article are declared. Ethics approval Sydney South West Area Health Service (RPAH Zone).